One year ago today, Tropical Storm Irene made landfall in New York City and roared through the northeastern United States. Originally a category-one hurricane, Irene was a massive storm that left a trail of destruction from North Carolina to Maine. Locally, the storm dumped 6.87 inches of rain on NYC and caused widespread power outages. Most of Irene’s impact, however, was felt further inland. Drenching rains in the mountains of upstate New York and interior New England caused extensive and catastrophic flooding. In the end, Irene claimed the lives of 58 people across 13 states and caused approximately $16 billion worth of damage. Today, Hurricane Isaac, another category-one “i” storm, is bearing down on the Gulf Coast. 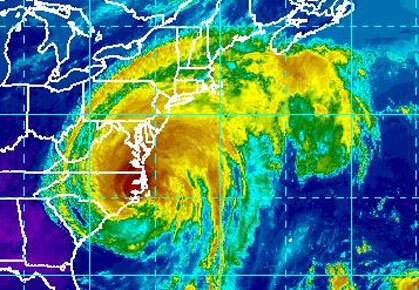 While every hurricane is unique, the enormous size of this current storm is reminiscent of Irene. This entry was posted in weather and tagged hurricanes, nyc, storms by Melissa Fleming. Bookmark the permalink.